Disclaimer: If you don't like SoL, a primarily female cast, or yuri undertones, you will probably not like this show. enjoyed the manga, I feel like the anime vastly improves the comedy of the series. In addition to this, The pacing and organization works a lot better for the show. From what I remember, the manga didn't explain anything in the world of Kobayashi for the first chapter, but the anime splices flashbacks in quickly within the first 5 minutes. This is a large improvement because it shows the capabilities of Tohru as a character and doesn't leave anything to be reinterpreted. When I think of slice of life, I generally think of slowly paced drags with no real value, but that's not the case with this show. Its quick pace with snappy jokes (mixed with some jokes that required more setup) makes the series feel more fun to watch and a good show for taking a break after a long day. The characters are fun and varied and it seems that, as of episode one, many characters still haven't been introduced so there's a lot of room for some more character dynamics. The animation by Kyoani is probably some of their better work. It relies less on 3dCG and uses lots of hand drawn effects. This may be a turn off to some because it may seem rough around the edges at times, but I never felt like there was any bad animation or art. The story is SoL so there really isn't one. It just follows the daily life of Tohru and Miss Kobayashi as Tohru learns about the human world through working for Miss Kobayashi. This is where some of the comedy lies since Tohru doesn't understand all the formalities of human life. As such, the antics that ensue build a lore around dragons in this world. Overall, this is a fun series that you can sit back and relax with, but it isn't exactly perfect. It has nice animation, fun characters (Miss Kobayashi BEST GIRL), and some nice backstory to the characters. I've seen a lot of anime with this premise, "person living normal life now has to live with a monster girl, wacky times ahead!" But I can't recall a female protagonist and I must say it's rather nice to deviate away from the common trope of "highschool guy thinks perverted thoughts about his monster girl roomate, girl screams and punches him." I also find it wonderful that Kobayashi is a blunt, and honest working class woman. Miss Kobayashi, got drunk one evening and ended up saving as dragon's life, Tohru, who had fled to the earth from another dimension. So, Tohru decides to repay her kindness by serving as Kobayashi's maid. And, therein lies the tale. This is a delightful tour de force of an overpower dragon trying to keep herself under control and hidden so that she can serve her master. Unfortunately, that is hard to do; as she often uses her breath weapon to cook a meal or masticates (chews) her master's clothing to clean it. In the second episode, they meet one of Tohru's friends, a smaller dragon, who also ends up staying with Kobayashi. their understanding of the earth is through their former experiences with humankind in their world. There is a delightful sequence in which they interpret the function of a see-saw to be a catapult for children to practice hitting dragons with large rocks, and this kind of misinterpretation is typical for them. Kobayashi is otaku, and soon find out that her dragon maid is more popular in the neighborhood than she is. This anime is overflowing with good ideas and lively situations. I can't recommend this one enough! I love how warm and friendly the atmosphere feels watching this. Also the moe is real, and I thought this wasn't going to be for me, but the cuteness and the character interactions are so natural and friendly; I can't help but not love it. I also love the pacing of the whole show, its very fluid. i love kobayashi/tohru, kanna/riko, and takiya/fafnir's relationships! Dragon Maid? More like Best Maid! Dragon Maid was one of my first Animes, I never liked anime and always had a negative opinion towards it. I finally gave it a try and I'm so glad I did. Now I'm a full blown weeb all because of this silly slice of life. The characters, The art style, The conflict, Dragon Maid will forever be the best/My Favorite anime in my heart! Every year it almost seems like Kyoto animation finds a weird niche genera and turns it into gold. They first started doing this with Suzumiya Haruhi which ultimately drove light novel adaptations into the spotlight for anime. From there they did Lucky Star and Nichijou which both basically popularized the comedy about nothing genera (at least in Japanese anime). Then they did K-On! which created the cute girls doing cute things genera which is all the rage these days. And of course, who could forget Free! the borderline BL sports anime which spawned multiple all guy cast sports anime in it's wake. They also popularized the visual novel to anime genera with Kannon, Air and Clannad and may have created a new genera with Sound! Euphonium from last year (which remains to be seen). And of course, who could forget the Moe art style that they pioneered with Suzumiya Haruhi. Even if you dislike many of these archetypes and generas, you can't really deny that Kyoto animation is one of the most influential anime studios on the scene. I am not that largest fan of many of these generas, but I still hold Kyoto Ani in high esteem despite this. There is a reason why I watched half of Myriad Colors Phantom World before dropping it like a hot potato and that reason certainly had very little to do with the plot or characters. KyotoAni is one of the studios that I look for in every season even if the genera they are doing is not my cup of tea. All of that aside, lets talk about this anime now shall we? Miss Kobayashi's Dragon Maid sounds kind of silly on paper. (though that could be said for 99% of KyotoAni's work.) To be honest, I just expected a "Cute Girls Doing Cute things" style anime, but when I saw that it was a Kyoto work, I figured I had to give it a chance. Fortunately, that skepticism was completely destroyed by the first episode. The characters themselves are fairly interesting even if they are slightly cliched. Even so, this balance of characters really helps to anchor the fantasy troupes and make them feel more "realistic". It is within these character based situations that the comedy and drama in this show really is at its best. 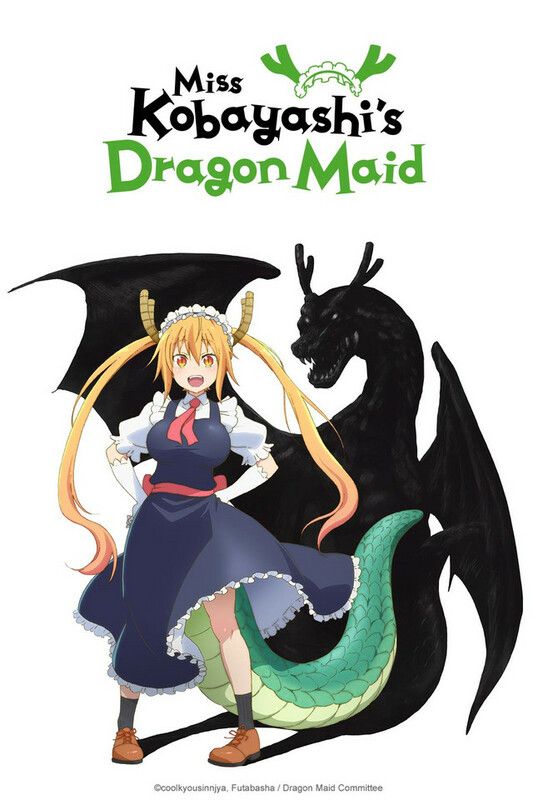 The show uses the somewhat clashing personalities of Mrs Kobayashi and Tohru as well as the absurd plot of an anthropomorphic dragon living as the maid of a human to its advantage. There is a fair amount of depth in this show; fair more then I initially expected. The show expertly mixes the right amount of comedy with the right amount of drama. Doing so, makes this show much more concrete and interesting despite the slow burn plot (slice of life style) and the somewhat cliche character troupes. The overall plot of Miss Kobayashi's Dragon Maid is subtle. There are aspects of this plot which could take a turn into a more serious tone, which has happened in a few moments. The show is pretty adapt at sliding from one absurd situation to another while giving us enough of an emotional anchor to actually care about the characters and this world. As with every show, I maintain my opinion that you can more or less tell if you will like the content after one or two episodes. In this case, I am more then sufficiently entertained to continue watching this show. I dare say that Miss Kobayashi's Dragon Maid may be one of the strongest shows of this season. If you are on the fence with this show then I can only recommend that you sit down and watch it. Note: I can't really give a new show higher than a 4 star rating. Once the show ends I shall revisit this review and update it accordingly. A fun show with good animation and an OP that can really grow on you. Miss Kobayashi's Dragon Maid is one of those shows I can't wait to see the next episode. So mush so that even though I was slowly drifting away from TV in general I bought premium specifically to continue it. Though it may be slow in some parts I love it and it only helps build the characters personalities more. Read the original Miss Kobayashi’s Dragon Maid manga, available from Seven Seas Entertainment!